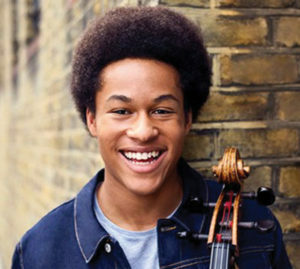 London, England — The Kensington Palace has announced that 19-year-old cellist, Sheku Kanneh-Mason, is on the list of artists scheduled to perform at the upcoming May 19 Royal Wedding between Prince Harry and Meghan Markle. He one of the brightest young stars on the classical music scene and winner of the 2016 BBC Young Musician of the Year competition, is already in great demand from major orchestras and concert halls worldwide. In January 2018, his debut recording for Decca Classics, Inspiration, was released, featuring the Shostakovich Cello Concerto No. 1 with the city of Birmingham Symphony Orchestra and Mirga Gražinytetyla. The album entered the official UK album charts at number 18 and reached number one in the classical chart. His international career is developing very quickly, and he has already made successful debuts with the BBC National Orchestra of Wales, City of Birmingham Symphony, Royal Liverpool Philharmonic and Tonhalle Orchestra, Zurich. In 2017, he made his BBC proms debut at the Royal Albert Hall as soloist with the Chineke! Orchestra. He is passionate about the importance of making classical music accessible to all and is currently the first London Music Masters junior ambassador. Sheku received the 2017 South Bank Sky Arts breakthrough award and, from 2018/19, he will become ‘young artist in residence’ at the Royal Liverpool Philharmonic. In February 2018, he performed ‘Evening of Roses’ at the Baftas Awards Show at the Royal Albert Hall, with four of his six siblings – the first time any artist has been invited to perform during the ceremony two years running. Sheku is currently a full-time abrsm scholarship student at the Royal Academy of Music, studying with Hannah Roberts. He began learning the cello at the age of six with Sarah Huson Whyte and then studied with ben davies at the Junior Royal Academy of Music.